The coffee ice cream method described in the previous post has been so successful at preserving the origin character of coffee that it’s turned into a minor fetish. I can’t stop making batches with different coffees, and eating them, which is getting me into some trouble with my girlfriend, who turns lycanthropic from caffeine past noon. A couple of Tuesdays ago, mid-fetish, when she kicked me out of the house suggested that I work remotely, I stopped by our local espresso bar, Coffee Mob. This place just happens to be my favorite roaster in the city, even inching out some of the heavy hitters from the West Coast. The barista pulled me a shot of the Burundian natural process they had on tap that day. Holy god was it good—syrupy, sweet, caramely, floral, and then … an explosion of blackberries. I’d never tasted anything quite like it. I was just picking myself off the floor when the owner, Buck, walked in. I told him it was the best shot I’d had in the last 6 months—and I’d been to Stumptown and Toby’s Estate just in the last week. So I came back, and listened to Ben from Long Miles Coffee tell the story of his journey into coffee production in Burundi, in the middle of a rising dictatorship, impoverished farmers, and some of the best coffee in the world. His family built a washing station for the farmers on three neighboring hills, and made a commitment to paying the farmers fairly and on-time … a departure from the status quo in the region. I brought something for the afterparty—a half-pint of ice cream, made with Stumptown’s Ethiopia Duromina, a perennial favorite. This coffee sings through the dairy with notes of cocoa, caramel, and blood oranges. Buck said he tasted the coffee through the ice cream in a way he never had before. Ben just ate the rest of it. I had a chance to try an espresso made with Long Miles’ latest batch of honey-process beans (a hybrid of washed and natural-process), which was delicious in an unusual way (a dark fruit flavor that was almost familiar), but I couldn’t stop thinking about that natural-process blackberry bomb. Buck gave me 100 grams of it try in the next batch of ice cream. 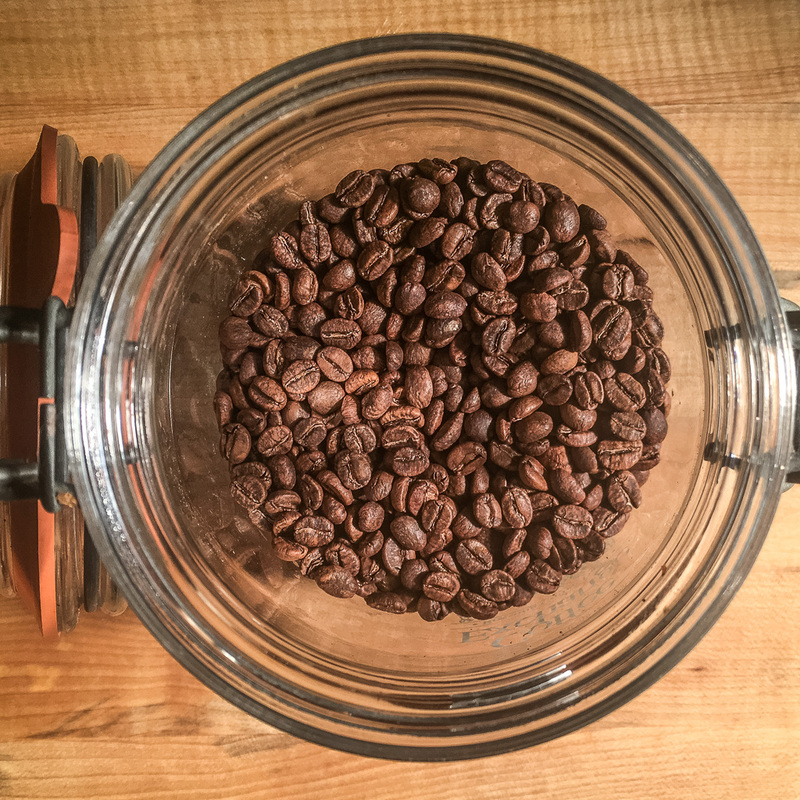 Long Miles Burundi Gishubi Natural Process, roasted to perfection by Coffee Mob. I was a little concerned that this coffee might be too distinctive—too weird—for ice cream. Some experienced coffee tasters are wary of dry-process coffees with too strong a fruit flavor. Such coffees can come off as one-note, or even a bit like artificial fruit candy. * And even if the flavor’s balanced, sometimes the more distinctive ones aren’t appropriate for everything. The first time I tasted Michel Cluizel’s Los Ancones single-origin chocolate, I thought: 1. this is one of the best things I’ve ever had, and 2. I have no idea what to do with it—besides just eat it as it is. Because it tastes like liquorice and olives. It’s surprising and wonderful as a self-contained experience, but may make people wince in an ice cream or cake. This time my worries were unfounded. The ice cream was unique and addictive. Chocolate blackberry, caramel blackberry, blackberry jam. I almost borrowed a Blackberry to write this post. I’m now tempted—and almost dorky enough—to serve multiple regions of coffee ice cream together, maybe each in its own demitasse. I’m thinking Ethiopia, Burundi, and possibly an Indonesian or Sumatran. Like the tired convention of serving something “three ways,” but in this case three wheres. Straight out of the machine. Earth tones belie the blackberry bomb within. Residence time 7.5 minutes, drawing temperature -6°C. Smoooooth. 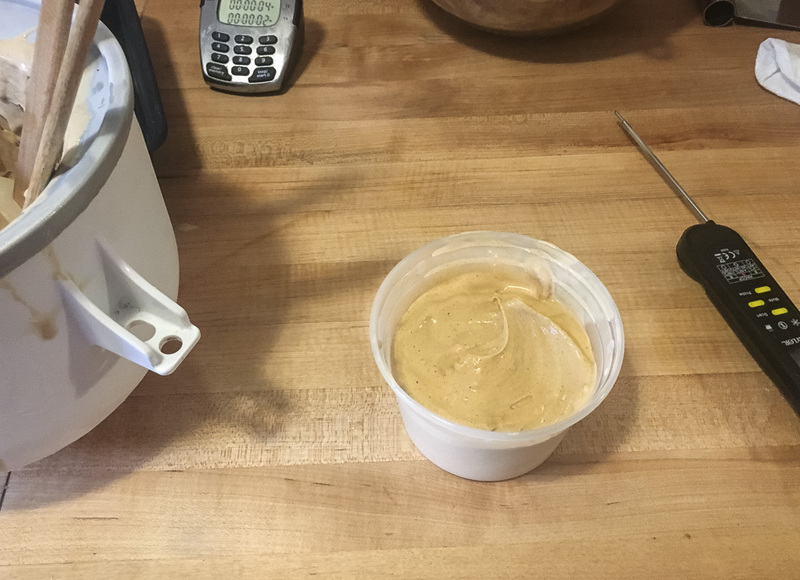 I’ve never monitored the temperature / time curve of the ice cream mix in the sous-vide bath, because I don’t have the kinds of lab equipment that make this easy. I have software for predicting the rate of temperature increase for a steak or fish fillet in a water bath, but doing so for an amorphous bag of viscous fluid is beyond my art. My wild educated guess was that with a bit of agitation, and with help from convection currents in the ice cream mix, it would take 15 to 20 minutes for the mix to get to 75°C, where it would then remain for a half hour. This last week I decided to test this hypothesis manually, by interrupting the process a few times up until the end and taking a temperature reading. The hypothesis was way off. The temperature rose much more slowly than I’d expected, was not impressively sped along by my early agitations, and never reached 75°C. This means that at least some portion of the locust bean gum has not been getting hydrated. It also means that the conditions for partial milk protein denaturing have not been what I’d assumed—although the exact expected effects of this are too complex and poorly understood to make any guesses about. My first experiment has been to split the cook into two stages. 30 minutes at 85°C, then 30 minutes at 75°C, with the water bath uncovered, so it will cool at a reasonable rate. I haven’t charted the temperature / time curve, but the result was clearly different. The ice cream has more body when frozen, and has resisted developing ice crystals in the freezer for two weeks … several days longer than what I’m used to. I’d like to do a few more experiments with cooking time and temperatures. This may lead me to updating the sous-vide instructions, and possibly even the stabilizer blends, for all the recipes in this series. There are all kinds of variables at play here, which will make absolute precision and predictability impossible. This raises the question of why to use an immersion circulator at all. I believe it makes sense, because 1. it’s hands-off, and once the temperature stabilizes at or near your target, it will stay there precisely, and 2. cooking in sealed environment is great for preserving aromatic flavors. Anatomy of a coffee cherry. From mishasmundi.com. *when you taste odd fruits in coffee or wine—something besides coffee or grapes— you’re generally tasting an aromatic compound that also exists in that fruit. But you’re not tasting ALL the aromatic compounds from that fruit. If the compound is in the coffee/wine in small quantities, you get a nice hint of blackberries (or whatever) that blends intriguingly with other flavors. But if there’s a ton of that compound, you may be reminded of other foods foods that include a ton of that single flavor compound, isolated from all the fruit’s background flavor compounds—think of a Jolly Rancher, or Fruit Roll-Up, or Instant Jell-O. Maybe not what you want in your coffee. How do these compounds end up in coffee or wine? Usually they’re either products of fermentation, maillard reactions from cooking (coffee), or barrel aging (wine). All three of these processes convert simple chemicals into a symphony of complex compounds, with more variables than science has yet been able to wrap its big head around. **A laboratory hot plate with a magnetic stirrer may be useful for this. I’m waiting for someone to make one specifically for culinary use. The Breville/PolyScience Control Freak is a nod in the right direction, but it doesn’t stir, and it costs $1800. The much-ballyhooed Instant Pot may be a decent low-budget solution for moderate volumes and home use, but it likewise doesn’t stir. The much-loved Thermomix is finally available in the US. This may be an ideal solution for small quantities. Not cheap at $1400+ but people use them for everything. For commercial quantities, a pasteurizer and a connected chiller are the way to go. With the experiment in which you cooked it at 85C for 30 minutes and then 75C for 30 minutes was the water bath preheated? Your technique seems to differ from most Sous Vide recipes as they typically preheat the water bath. What are your thoughts on that? I have just read through this entire post and, thank you! I have been researching for over a year on the internet for any kind of useful, well written, and correct information on making GOOD ice cream with no luck. I finally found what I was looking for. I have been experimenting for a while now and just couldn't find the answers to some questions. I am not the most technical person but this has filled some gaps I have been trying to figure out. Thanks for posting this. I read through the entirety of this series yesterday, while working on a recipe for pistachio ice cream. It was really helpful! You mentioned a chocolate ice cream recipe that you worked on once. It would be interesting if you could do a post on that.